The saying goes that preparation is the key to success. Too often, people look back on their missed opportunities and wonder what could have been. That’s not going to happen to me, though, and I think, when’s all said and done, people are going to be pretty impressed by how ready I am for the Gold Rush, if a new Gold Rush happens. Obviously, there’s no guarantee that we’ll ever hear about a rich vein of gold being struck in California or anywhere else. 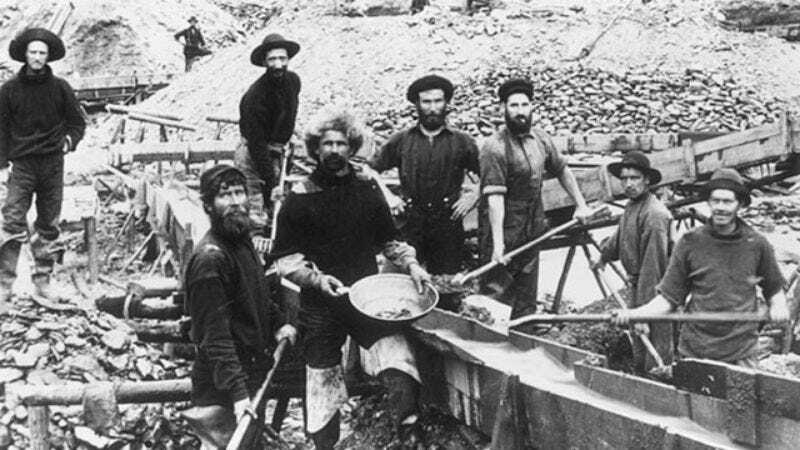 It could be years until prospectors start swarming west again to find untold riches. But on the day that it happens, I think everyone will be feeling pretty foolish when they see that I’ve already packed my bags with mining gear years before this hypothetical Gold Rush ever began. One only needs to see the trunk of my car, which is loaded with all the basic prospecting tools I could ever need for the 2015 Gold Rush, or the 2016 Gold Rush, depending on when it happens, if it happens at all. There’s a gold pan to sift through riverbed gravel. There’s a quality pickaxe and a shovel from the hardware store along with spares of each. These will all be perfect for the new Gold Rush, should there ever be one. …everyone will be feeling pretty foolish when they see that I’ve already packed my bags with mining gear years before this hypothetical Gold Rush ever began. You see, it’s not enough just to travel to California, assuming that’s the place they find the gold that I’m not sure they will ever ultimately find. We learned that the hard way in the 1850s, when treasure seekers flocked to San Francisco without a game plan and many ended up losing more money than they earned. I’ve done my research on where the most lucrative deposits were, so when the gold comes back (if the gold comes back), I’ll know exactly where to go and how to get the gold. At the end of the day, I hope my family members and friends realize that when the new Gold Rush takes place, if the new Gold Rush ever takes place, and I’m swimming in piles of gold, if that’s how this all shakes out, I’ll be able to spread my newfound wealth to them, along with a variety of charities. Hindsight may be 20/20. I’ll never have a crystal ball telling me exactly what to do or when to do it. But there’s no excuse not to be ready for the day California once again is bursting at the seams with gold. Jesus, I hope it happens soon.